The anthem was too slow for my taste, but I’m particular about my Star-Spangled-Banner tempi. We were gathered at the start line, bouncing up and down to stave off the early morning chill. The national anthem, sung by a talented local law enforcement officer, signaled to us that it was almost time to get running. In a moment there would be a prayer led by a pastor from Newtown, and a tribute to the Boston Marathon, but we didn’t know that yet. The anthem went on, and most of us were still and listening. I didn’t see a flag, but everyone seemed to be looking to the right, toward the capitol building, so I turned that way, assuming that a flag was in that direction. At the end of the song it became clear what the singer’s game was: he liked to hold the note of “free” and give a huge crescendo. It was a nice effect. He was singing “free”, and I was looking toward the historic gold dome, past the soldiers with guns hovering on a platform a few feet from me. Has the world always been changing this fast? It had only been a year since the last time that I had gathered with tens of thousands on the streets of the city where I was born, and it seemed as if life had been turned on its head. There had been an unthinkable massacre in that state, there had been a jarring attack in my adopted home. We got clear bags this year. 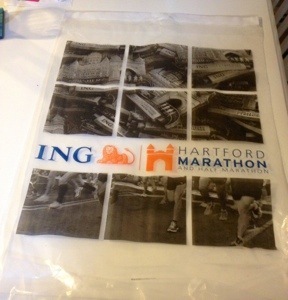 Instead of the usual cloth bags that participants have been given for years, everyone was given a plastic bag with the marathon logo on it. That was the only bag that would be accepted at bag check, and the staff had to be able to see everything in it. That’s what I was thinking about as the baritone sang about the land of the free: plastic bags. Has the world always been changing this fast?